Safefood 360° user wins SQF Practitioner of the Year 2016. 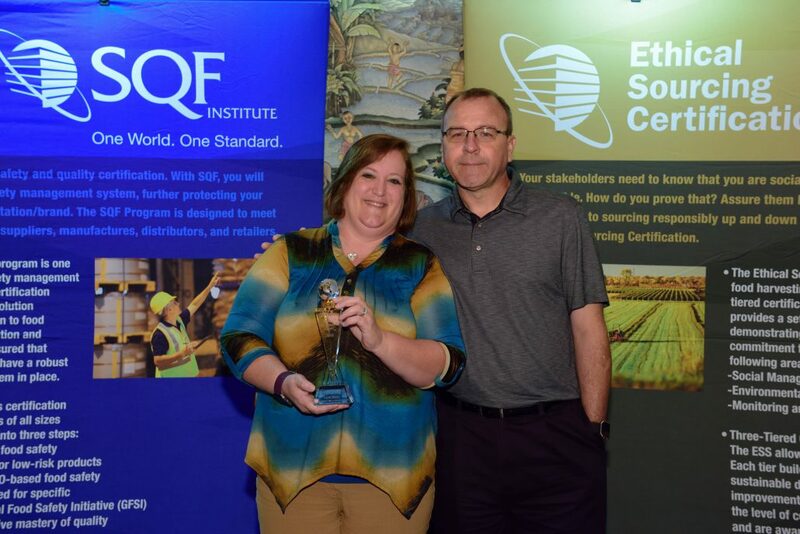 This year’s SQF conference saw the coming together of almost 1,000 SQF individuals to share knowledge and skills in order to strengthen the food safety and quality programs of businesses all throughout the United States, and indeed the rest of the world. 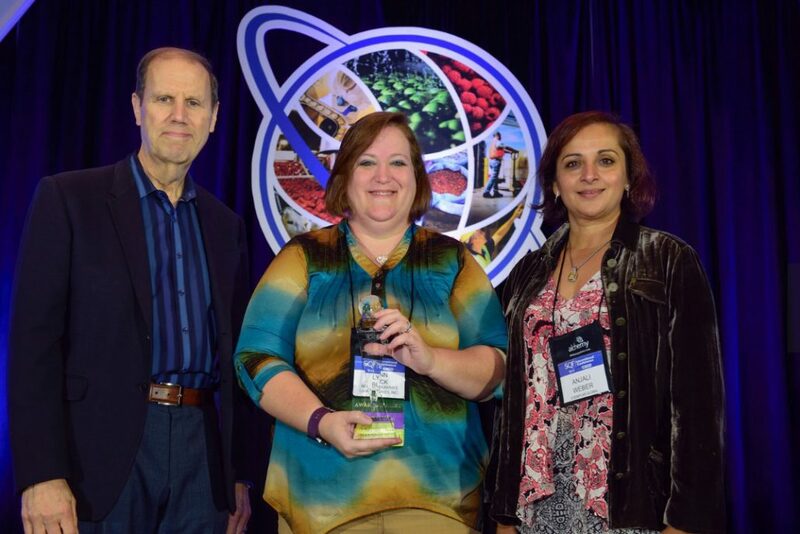 We were delighted to hear that Safefood 360° master user Lynn Buck, SQF Practitioner at Mother Murphy’s, a food flavor and extract plant in North Carolina, was honored as the SQF Practitioner of the year for 2016. I sat down with Lynn to discuss her win, the value of SQF in relation to other GFSI certificates, and the future of food safety management. Congratulations on the award! It’s a great achievement. What does it mean to you? It means we’ve accomplished great things in the 6 years that we have been complying with SQF. We’ve gone from low procedures and little regulations to being fully compliant with all the GFSI standards and FSMA. When we first started, we didn’t have any operating procedures at all, and now, we’ve top marks in all of our audits and internal standards. It also means that I’m helping to spread the word about GFSI and SQF in the food safety community. The award is not only a reflection on me and Mother Murphy’s, it’s also a reflection on being able to help other companies and the next generation of food safety professionals move forward. The award is a reflection of being able to help other companies and the next generation of food safety professionals move forward. If you see the award as an ambassadorship, do you think you’ll do anything going forward in the next year that will build on that? As the FSMA changes are GFSI certified, we now have to physically go and audit our vendors. We have vendors that are not GFSI certified, and I hope that I can help introduce them to it. Vendors need to understand the importance of ensuring that they have everything in line and are ready for the changes that are coming. I’ve also volunteered to be on the planning committee for the SQF conference next year, so hopefully, I can help with that also. In what capacity would you see your involvement on the SQF conference? As an educator or facilitator and getting the speakers together? This year, I monitored two of the roundtables, which had a lot of great discussion with participants across various roles involved in manufacturing food ingredients. I can see myself helping to get people into a room and talking, so they can see if they are having the same issues as others in the industry. If we can come together in open discussion, we can help each other fix whatever problems we have and go forward from there. I enjoy doing things like that. Our company’s president has encouraged me to get more involved and to help other companies move their SQF journeys forward. It’s great to have the backing of our management and be able to go out and do that. Being a teacher has always been part of my passion, and it’s nice to be able to combine that with the everyday duties of my job. How long has your company been complying with SQF, and what do you perceive are its biggest benefits? SQF gives us a greater customer base, and our customers have the security of knowing we are complying with food safety laws, which brings in more business as they have more trust in us. It provides our employees with better knowledge about food safety. It teaches them that they can’t keep doing things the way they are used to. They can do things in a safer way, and that way, we have less risk of anything going wrong. SQF breaks down food safety into layman’s terms where anyone can understand it. It makes it accessible. We looked at BRC and FSSC 22,000, but neither really fitted what we were doing. SQF breaks down food safety into layman’s terms where anyone can understand it. It makes it accessible. Being one of the first flavor houses that was SQF certified has really given us great benefits. SQF is a perfect fit for us. Why did you choose SQF as your certification standard as opposed to another GFSI certificate, for example, the BRC? During our reviews, SQF appeared to go more in-depth with where the GFSI standard was heading at the time. SQF is more manufacturing and less documentation based than BRC. We wanted to be able to focus more on the manufacturing side and that’s where we’re being fully compliant. We knew our documents were in order as we had done the basic GMP audits and had our prerequisite programs in place, but SQF was a better fit for what we were looking for. BRC seemed more ISO than where we wanted to take it. SQF just seems more for the boots on the ground. You have chosen Safefood 360° as your platform for operating your SQF system. What has been your experience with using the software and its impact on maintaining your SQF certification? What Safefood 360° has done for us has been great. The ease of access to everything has brought a lot to the table with customers and vendors. It has reduced our audit times exponentially because everything is right there. It’s like nothing that I’ve seen out there. Safefood 360° has reduced our audit times exponentially … it’s like nothing that I’ve seen out there. It’s also been a fantastic asset with the PCQI, as I’m doing risk assessments on all of our ingredients, and it’s been easy for me to go through and set up all 3300 hundred of them! Safefood 360° has been a huge tool for us and a great experience because the Safefood 360° customer service has been beyond any expectation and beyond any that we have tried to work with before. Do you feel certification under the SQF helps you in any way to meet the requirements under the new FSMA legislation? It helps ensure we have our PRP’s in place. It means that we’ll have to help our Suppliers understand what needs to be done as some have told me, “I’ve never even heard of FSMA”. It is trickier for the Foreign Ingredient Supplier, but we buy from brokers and don’t import directly. Do you see that there is still an unpreparedness for FSMA with most of your suppliers? I do and it is a little disconcerting. We have some large ingredient suppliers that are refusing any kind of third-party certification. I don’t understand it as it means we’ll have to find new vendors as, how are you going to stay in business if you don’t comply, or try to comply? Our vendors have to be able to prove this to us. If they’re not willing to let us visit or go through any third-party audit certification, which is now a FSMA requirement, then they’re doing something that’s not on the up-and-up. Is that what you see as the major threat with the new FSMA legislations? Not that you have to be compliant, but ensuring compliancy with the people that you’re dealing with? The new preventive controls mean that everything is going to fall back on you. Responsibility is no longer only on just the vendors. It’s ultimately going to come down to the producers themselves to make sure that everything is compliant. Where next for Mother Murphy’s in terms of food safety management? Have you any new plans for improvement or change? We will be going towards level 3 certification when SQF gets upgraded to version 8 next year, as level 3 will be breaking away as its own audit. This means the manufacturing audit and a level 3 quality audit will be independent. You can pass the manufacturing audit and fail the quality audit, but it won’t affect your manufacturing score. We also have the option of doing an unannounced audit every year or every three years, and we might choose to do one unannounced each year. This will help push being audit ready at all times and making sure that everybody stays on the up-and-up all the time. We’ll also have the option of doing unannounced audits every year. I want to be able to say, “hey, we have an unannounced audit every year, and we never know when they’re coming in or what the score is going to be”. This is proof that we’re audit ready and working towards being compliant at all times. From upper management down to our mixers and packers, our staff can take pride in knowing, “hey, we did this, we made it through this unannounced audit X amount of years in a row and kept the score where we wanted it to be”. If you switch to the 3-year unannounced audit schedule, are there plans to introduce new improvements or change? Everything we have in place is well established. Our biggest area for improvement is to make sure that we have all our quality procedures in place and documented in order to be able to move towards level 3. Thank you for your time today Lynn, and congratulations on the award again. From our conversation today, it’s clear to see why you won it! It was totally unexpected! I think the biggest factor in deciding was that I go to universities and give food safety presentations. I help customers and vendors set up their systems, and I constantly push SQF and the need for a good food safety program like Safefood 360°. I think that was one of the factors in who got the award, because that’s what this award is all about, being an ambassador for SQF.